Molly Thompson-Smith is dreaming of a medal when climbing makes its bow at next year's Olympics and hopes her exploits will encourage more black people to take up the sport. The 21-year-old, who is vying to be one of the two British women who go to Tokyo, told AFP she is keen to change the image of the sport as being the preserve of whites only. Thompson-Smith, who showed her potential when she became the first British woman to win a medal in a World Cup event in November 2017, says she wants climbing to be accessible to all. "Ninety percent of black people have not climbed before and I would like to change that," Thompson-Smith said at the launch of thinkBeyond Talent, an agency focused on supporting athletes to use their talent to bring about positive social change. "I would definitely like my position in the sport to be about more than the performance element. "It is my life and revolves around a strong community lifestyle and I would love to have more people who look like me involved. "I would like to work with the national governing body British Mountaineering Council and use advertising to encourage a broader group of people to climb walls." Thompson-Smith, who says she will also use social media to spread the message, says by performing well she can raise the sport's profile among ethnic minorities. "It is easy to gravitate to sports role models you can connect with and relate to," she said. "Climbing is linear and everyone looks the same. There is a lack of different role models and that probably stops black kids getting involved. "It is easier to want to be like your favorite footballer who looks like you and you can see a path that way so I am hoping I can be a role model for them." 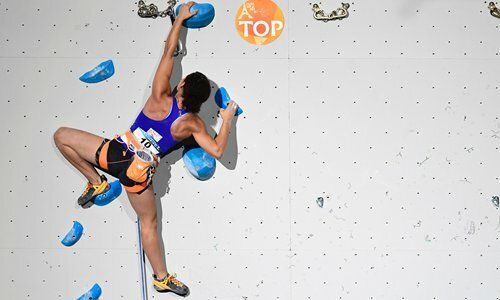 The climbing event at the Tokyo Olympics will feature three disciplines - speed climbing, bouldering and lead climbing. The eloquent Thompson-Smith, whose German boyfriend and fellow climber Jan Hojer is also bidding to compete at the Olympics, first got the climbing bug when celebrating her seventh birthday. "Up until that birthday party I had had a sporting theme every year but once I discovered climbing there was no point having a party with sports involved the next year," said Thompson-­Smith, who admits she was blissfully unaware how her guests viewed being asked to climb a 10-meter high wall. "It is a sport which does not feel like a sport is the best way I can describe it. It is a challenge both physically and mentally. "It does not feel like your average netball game or going for a run. This is way beyond standard activity." The fearless approach of Thompson-­Smith - who admits she is more used to the bright lights of London, only visiting the countryside for the first time as a teenager - on the wall is in stark contrast to her squeamishness off it. She is proud of her "Frankenstein" finger on her left hand - she gave it its name due to the zigzag stitches. But when she underwent the operation to fix the ruptured three pulleys, which keep the tendons close to the bone, it was a very different story. "I only had a local anaesthetic. There were tears during the ­operation and plenty after it too," she said. "I am very squeamish. I cannot go to the dentist because of the injections and I faint at the sight of my blood being taken." This squeamishness was matched by her determination to get back on the wall - which she did 20 days after surgery but with only one hand operational. Such single-mindedness should stand her in good stead for both her goal of going to the Olympics and ultimately making the sport in England more diverse.